I can’t tell a quinella from quinoa and horses scare me a bit. But every November, I still find myself shouting at the TV or hugging strangers. One year on Melbourne Cup day, I found myself alone at home. I was knee deep in a frustrating report that wouldn’t be finished without a fight. Race time gave me an excuse to sneak off for a desperately needed break. My two dogs and I plonked down in front of the telly. Truthfully, I can’t tell a quinella from quinoa and horses scare me a bit. But I still found myself shouting the name of a horse I didn’t know existed an hour ago, hugging my slightly concerned dogs and getting a bit teary over the winning jockey’s victory speech. While I calmed down with a soothing glass of champagne (which made the report seem far more achievable) I realised I’d contracted Melbourne Cup-itis yet again. November shows up so Australians throw their worries away and back a horse because of the colour of its jockey’s shirt! · Drive normally sedate people to yell, wave their arms about and hug relative strangers. · Convince people to risk their hard-earned money on one of the most unpredictable races in the world. · Make lots of people very happy, even when they discover they spent their money on a horse that turned out to be a donkey. · Decide to unflinchingly back yourself (or your team), even when the odds aren’t good. Don’t stop shouting until you’re past the finishing post. · Decide to just give some things a go. Win or lose, it’ll be an exhilarating ride you’ll never forget. · On some days, appreciate the amazing effort it takes for you (or your team) just to turn up and compete. · Celebrate your successes (which doesn’t just mean being the winner) wildly and loudly! And just like the Melbourne Cup, come back again the next year and do it all again. 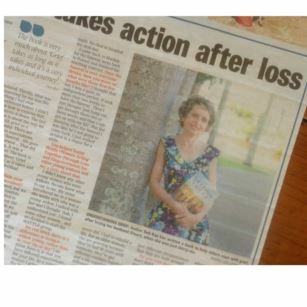 Deb talks about her journey through grief and the creation of her book 'Getting There'. Click here to listen to Deb talking about her journey through grief and the creation of her book 'Getting There'. Shouldn't She Be Over It By Now? Do you know what to say to someone going through a tough time? How can you be there for someone who has lost someone or something precious? In our society, we sometimes have unspoken expectations for grief. For example, we might think it should be over within about a year, that it roughly follows a few stages and that eventually it’s all done with. The person will ‘get over it’ and ‘move on’ with their life. Without realising it, we’ve created fixed ideas about how upset people should be and what types of things they should and shouldn’t do when they’re grieving. I know I had all those ideas before my husband died. I’d seen plenty of Hollywood movies and that’s how grieving happened nearly every time. When you’re actually struck by grief though, all that goes out the window. I couldn’t make my grief fit into any timeframes. I had no idea how I was going to feel that afternoon, let alone next week. And I definitely couldn’t make it stop when I thought it had gone on long enough. If I tried, it just came out some other much more embarrassing way, in the supermarket or while I was at the bank. I think we can make it easier for everyone – the people who are grieving and the people supporting them – by accepting that grief takes as long as it takes. It doesn’t follow a neat, linear pattern and it won’t stick to a schedule. It’s ok to take the time you need to do the things that work for you to get through it. People who are grieving don’t always need you to have the answers, because often there aren’t any. A wonderful gift you can give to someone going through a tough time is just be with them, listen and create a space for sharing whatever’s happening for them in that moment. Thanks to the Daily Mercury for their interview. We talked about how Stu died, why I wrote the book, and if you ever 'move on'. Here's a snippet. Can you explain your life before the accident? Stu and I loved to travel, but we didn't want to be tourists anymore. We decided to teach English all over the world indefinitely so we sold our home, our car, quit our jobs and headed off. We'd been in Poland for about five months when Stu headed our with his indoor soccer team. It was the first time that we'd been separated. I said, "Go, enjoy yourself." He was hit by a car on a pedestrian crossing walking home that night. He died in hospital the next day. I came back to Mackay for the funeral, then went back to Poland and finished our teaching contract. Once the funeral is over, everyone thinks 'now you move on'. What were those first few months like? I thought that too. I was quite an independent person. It took more than two weeks to have the funeral. I thought that all I needed to do was get through those few weeks, then I'd get on with my life. But the morning after the funeral, I suddenly realised Stu was really not coming back. I just walked around in a stupor for a while. Do you ever 'move on'? I don't think so. Stu's and my life together shaped who I am. There is some level of grief for a long time, but it's not so overpowering. I think it's about accepting that the person was part of your life, and they stay part of you. You create a life where that is still within you and you continue your life. You really don't need to say anything. You just need to be there and listen. After 10 years of work, my book is finally in print. Now it's time to celebrate! The launch of Getting There: Grief to Peace for Young Widows was a fabulous celebration! Author Deb Rae shared her personal story, the process of writing her book over ten years and how it can be a useful for resource for other widows, their families and support professionals. It can also help us change the way we think about grief as a community. Sharon Schoneveld (Clinical Social Worker) outlined the four attributes that create stress in our lives (change, control, inclusion, competence) and how widows can experience all of these at once. Peter Sherlock then talked about how relevant Getting There has been such a support for him as an older widower! More than 90 people attended the launch, including representatives from Mackay Regional Council, various community service and business organisations, Department of Communities, CQUniversity, various local schools and Qld Health. Deb also acknowledged Mackay City Library for hosting the launch and for their much appreciated support of local authors. For people with big dreams and clear goals, roadblocks along the way can be very frustrating. But it's only through these setbacks that we can truly be opened to new possibilities. When you're working towards a goal, roadblocks along the way can be very frustrating. They pull you away from your ‘real’ work and demand so much precious time and energy. With this distraction you can lose focus, then have to work even harder just to get back to where you started. There is another way though. Instead of struggling against setbacks, greater rewards can be gained from using them to your advantage. Valuable opportunities are embedded in your problems, if you can put aside your frustration long enough to see them. When you do this, your progress will be far beyond your initial expectations. How do you react when things do not go the way you planned? Do you get angry? Find someone to blame? Fight the urge to quit? Or get even more determined to succeed? Regardless of which (or how many) reactions you experience, most important is which you choose to act upon. Resist the impulse to revert to old habits when you are confronted with a problem. Instead, decide to consciously choose a positive, constructive frame of mind. Even if you do not know exactly what to do yet, you can choose an approach that will serve you well in the long-term. For example, an older worker who is made redundant could react by feeling depressed, angry or victimised. Or they could now see an opportunity to create the future they have always wanted. They may choose to pursue a long-held passion, start their own business or spend more time with their family. When you are forging a path towards a goal, it is not uncommon for your vision to narrow. That singular focus can keep you motivated but it can also blind you to new ideas, excellent innovations and influential people. The path to your goal is not a one-track, linear process. A problem you might consider as a huge step backwards could actually be a springboard to exciting business opportunities. Setbacks compel you to look for new ways to achieve your goals. They can unleash your creativity and encourage you to consider all options, from multiple perspectives. Actioning just one of these options could generate significant returns and supercharge your progress. For example, the resignation of a key senior staff member could prompt a revamp of your business structure, resulting in greater efficiency with lower costs. A failed product can also trigger the development of a higher quality product, better production processes and a new customer base. Sometimes there are no immediate benefits to be found in a setback. They just create so much hassle that you can barely get back to normal, let alone find any extra opportunities. While you may not gain any tangible benefits in the short-term however, you might identify some useful long-term learnings. It sounds simple, but when you are focused on a pre-determined path to an outcome, busy and stressed, these everyday lessons could be lost to you. For example, being confronted with a complicated, expensive computer problem could motivate you to rapidly improve your technological skills. With these skills, you could prevent future IT problems, negotiate effectively with IT consultants and implement new IT applications that save you time and money. Other valuable learnings may be what not to do when employing staff, how to structure your schedule for maximum efficiency, and which tasks you are better off outsourcing than tackling yourself. Setbacks can be draining, costly and frustrating. They can also be a source of opportunity and a driver of innovation and growth. Whether setbacks have a beneficial or detrimental impact on your business depends on how you approach them. When you manage your reactions, maintain a broad vision and actively seek learnings from setbacks, you can discover valuable opportunities with potential for astounding achievements. These opportunities are waiting for you now, in every future problem you are fortunate enough to encounter. In today’s world, it’s easy to think that happiness is all about fun - Ferris Wheel rides, trips away and delicious fast food. But I discovered there are other types of happiness that last much longer than a roller coaster ride. A couple of weeks ago I went to a conference in Sydney. It wasn’t your standard hotel variety, with endless lectures, windowless rooms and nasty coffee. This was a conference about happiness. At Luna Park. And the Dalai Lama dropped by. In today’s world of instant gratification, it’s easy to think that’s what happiness is all about – Ferris Wheel rides, fun trips away and delicious fast food. But in between hot dogs, I discovered there are two other types of happiness that last much longer than a roller coaster ride (and have much nicer after-effects). Pleasure: Parties, great food, funny movies, Sunday sleep-ins. Engagement: Finding joy in being a parent, your work and your leisure activities. Meaning: Knowing your strengths well and using them to support something greater than you. All of these options are good for you (as long as you don’t go crazy with the parties and sleep-ins). It’s great to try a bit of each type of happiness every day. Some types last longer and go deeper than others though, so they’re much more satisfying. For example, I once met an Aussie mechanic who was fixing bikes for villagers in Sri Lanka. These people needed a bike to get to work but couldn’t pay for expensive parts. The mechanic found clever ways to use everyday items and get their bikes going again. The villagers got to work and had money to feed their kids. And the mechanic knew happiness that lasted much longer than my Ferris Wheel ride. We don’t all need to zip off to the other side of the world to find meaningful happiness though. You can use your strengths every day to change lives. Teach a child compassion, donate to a charity, help out at the local scouts club, support events in your community, make birthing kits for women in Africa. Or just give your smile and hugs to someone who really needs them. You’ll have that amazing feeling of being at your best. And others benefit from what you give. It’s hard to not be happy about that. For a while now, I’ve strongly suspected that going through a tough time is a lot like climbing a mountain. My suspicions were confirmed a few months ago when I tackled Mt Kilimanjaro in Africa. As human beings, occasionally we have to go through some really tough times. We lose our jobs, people we love die, we get sick or we try to give up smoking. For a while now, I’ve strongly suspected that going through a tough time is a lot like climbing a mountain. Such endless hard work, pushing further with tiny steps every day. My suspicions were confirmed a few months ago when I climbed Mt Kilimanjaro in Africa. At about 6000 metres high, Mt Kilimanjaro (Kili for short) is the highest free-standing mountain in the world. It’s just a bit higher than Everest Base Camp. 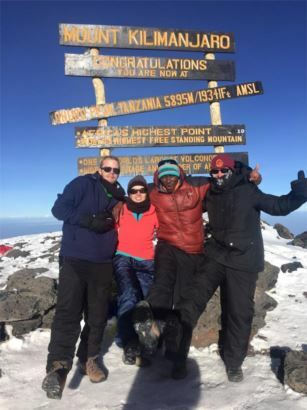 I trekked up and down Kili for six days with eight family members and friends. Almost immediately, I could see all my tough times right there on that mountain track. The first signal was having to pace myself so the journey didn’t become even more painful. As you get higher on Kili, altitude sickness can make the trek very uncomfortable. That can mean anything from feeling nauseous to vomiting every now and then to dying. The best way to avoid these nasty side-effects is to walk slowly. Very, very slowly. The locals call it ‘poly-poly’. I call it the slowest funeral march of all time. For an energetic young-ish woman used to being busy all day, this is excruciating. All I cared about was getting to ‘the end’. Then there’s all the stuff that’s going on in your head. When you’re walking slower than your grandmother you have way too much time to think. In the blank spaces, my top ten list of tough times all came back into my memory for a re-run. One by one, I dragged my mind back out of the dark and scary places I thought I’d forgotten about. But I wasn’t on the mountain alone. I was with my family, friends and a skilled guide. They cheered me up, kept me out of my own thoughts and made me keep moving, even when I thought I couldn’t. We walked together, through the rain, snow and pain. They stopped me from slipping and showed me the plants and animals I would have missed if I’d been rushing like I usually do. And I did all that for them too. When you’re going through a tough time, you need all those things. You need to go slow, so you can plan your next step. And so you can appreciate what you have. You also need to take time to process your thoughts, even if it’s a bit painful. Strength comes from knowing yourself well and being able to manage your own mind. And you need people to look out for you, let you know when you’re getting off track and allow you to do the same for them. It might sound like my trek up Kili was endless mental and physical torture! There were moments like that, but they’re forgotten when you reach the summit. You need every ounce of your energy to drive you through the last few hours of pain, cold and tiredness. Then suddenly you’re at the top. The sweetness of that moment can only be felt after you’re endured every slow step, suffered every ache and let every crazy thought go. You realise that if you can climb this mountain, you can get through any tough patches. You just need to take your time, choose thoughts that serve you well and share the track with people you care about. Sometimes the simplest things can be the most valuable. An old tyre, a couple of sticks and the open air is all that’s need for pure enjoyment. Our lives today are crammed with more to choose from, more to achieve and just more to get done. More products to buy, TV shows to watch, rows of breakfast cereals to choose from, work and home jobs to juggle, and lots soccer games and play dates to fit in too. It’s easy for life’s simple pleasures to get lost in between appointments when you’ve got a head full of decisions to be made. It seems the more we get, the more we expect to get. We constantly check our phones (every 4 minutes on average), can’t wait to get the next new gadget, have conversations on Facebook while we eat dinner and plan for a bigger car or house or pay cheque. Our worth is measured more by how busy we are and less by the quality of our connections. But maybe having less really is more. Two theorists (Mullainathan and Shafit) suggest that having less options can actually make us happier. You can see this when we make the most of our last few days of holidays and cherish the hand-sewn dress our grandmother made. And we’re convinced the last chocolate in the box tastes so much better than the others. We can create the same benefits of scarcity in our everyday lives. Rather than reaching for the next new thing, take a bit more time to enjoy what you have here, right now. · Concentrate your attention on your next conversation – listen with your whole body. · Slow down to really taste every mouthful of your meal. · Plan to look at your phone only a few times a day. · Take a few minutes to just breathe. Become fully aware of the sounds, smells and sights around you. · Once a day, think of the things you are profoundly grateful to have in your life. These are such simple acts, and they’re all that’s needed to really appreciate what you have right here and now. Because really, that’s all we have. What Could Eurovision Possibly Teach Us? The Eurovision Song Contest, in all its glorious wackiness, perfectly displays the joy of being authentic. Whether you love it, hate it, or just think it’s weird, the Eurovision Song Contest displays the full glory and passion of the human spirit. These performers come to a world stage with their wacky costumes and unique performance styles and have a blast! I don’t always like their music, but I love their courage. Whatever the world says about them, they’re willing to be totally vulnerable and just be their authentic self. How can that have any relevant for you though, in your everyday life far away from whacky costumes, glittering stages and screaming fans? Brené Brown can help us work that out. She wrote The Art of Imperfection and has her own definition of authenticity, as “the daily practice of letting go of who we think we’re supposed to be and embracing who we are”. • Catch yourself with you comparing your clothes, car or husband to someone else’s. • Choose a car, clothes or husband you like, rather than what you think other people will like you for having (yes, sometimes some of us do that!). • Take the time to do the things that truly make you feel fulfilled (Growing organic food? Model car building? Travelling? Singing a power ballad in a big dress in front of a wind machine?). • Acknowledge the self-doubt that pops us and suggests your authentic self isn’t good enough, or that people would prefer the old you that always tried to make everyone else happy. Then let that idea go. People with heart appreciate and connect with people who are genuine. While it might scare them at first, they also secretly admire people who have the strength to walk their own path. It can be a rocky one, but it’s still way better than going the way you’re ‘supposed to’ and ending up somewhere you don’t like. We live in a world that is busier, more connected and changing faster than ever before. With such complicated lives, time management has become a highly valued skill. In fact, with so much to do every day, managing time can seem like a constant battle to cram more tasks into less time. There may be some meetings you simply must attend, reports that have to be completed or jobs you just can’t avoid. 2. What changes can you advocate for? Your report may be non-negotiable but could its format be simplified? Could you suggest making meetings more useful and less lengthy with a clear agenda and some preparatory work? 3. What can you delegate or swap? Is there someone already doing a task on your list so you could share it? Maybe you can swap tasks that drain you with someone who thrives on them? Or maybe there’s a student or people doing work experience who needs some new opportunities? 4. What can you combine? Can you write one report that meets the needs of two different managers? Or combine a professional development session with a team building activity? Be careful about multitasking – trying to do two or three important tasks at once usually means your brain can’t focus enough to do any of them and you’re left exhausted. Just multitask simple stuff like folding flyers while you watch television or making a phone call while you’re photocopying. 5. What could be more efficient? Would a tighter meeting agenda keep your team focused? Could you develop a standard template for letters you send often? Or maybe you could make better use of your electronic calendar? To really discover what time you might be wasting, keep track of how much time you spend on tasks for a couple of days. 6. How can you empower others to be more efficient? Can you support other team members to prepare for meetings or train the Chair to keep meetings on track? Maybe you could support staff so they eventually come to you with a potential issue and a solution, rather than just a list of problems? We have so much to do and so many options in our world today that we can’t possibly fit them all in our lives. Prioritising what we’ll do with the time we have is far less exhausting and allows us to be much more productive. The sense of fulfilment created by focusing on what’s most important can also never be achieved by constantly cramming tasks into short spaces of time. What does your work performance appraisal remind you of? Being in the principal’s office at high school? Sitting for a major exam? While we may talk about performance appraisals being about providing mutual feedback and shared learning, for many organisations, the reality is an out-dated process based on power and fear. In this atmosphere, the performance appraisal process can be doomed before it starts. Feeling like you’re facing your school principal hardly encourages an equal relationship. Meeting just once a year also doesn’t build the shared trust needed to support honest, useful feedback. The whole process can become an almost irrelevant chore for everyone involved. Instead of approaching performance appraisals as a dreaded once a year obligation, imagine if they actually supported staff, improved workplace productivity and were even looked forward to by everyone. Performance appraisals are actually a gift – to the staff member, the work team and the organisation. They have the potential to produce feedback that can’t be found anywhere else, cement the loyalty of valued staff and generate fantastic ideas. 1. Ditch the annual appraisal. Break it up into monthly informal and formal meetings that focus on just one aspect of the process. Dedicate a few of the monthly sessions to collecting feedback, then providing feedback. Create a culture and skills base that values and supports honest information sharing. 2. Incorporate performance appraisal processes into already existing work practices. Don’t wait for a person’s annual performance appraisal to talk with them about a work issue. Discuss it right there and then, on the shop floor. Hiding performance discussions away can create distrust and fear. Discussing issues openly in a positive manner can save time and heartache. Be mindful of your approach, your choice of words and the person’s right to confidentiality. 3. Link the person’s individual work goals to strategic goals. Support them to understand how they contribute to the overall performance of the organisation. This can create a sense of ownership, value and meaning for their individual role in a much larger machine. 4. Don’t link performance appraisals with pay rises. Demonstrating your work outcomes for a whole year in just one performance appraisal meeting once a year can be difficult. Staff can feel devalued, stressed and resentful. And that’s before they even find out whether or not they’ll get a pay rise. It’s more realistic to collect information at each monthly meeting with a staff member, then collate and review the data to make a decision about pay increases. Performance appraisals can often become a session to highlight all the things a worker does that have been bugging the manager all year. Dispel that negative environment by pointing out the person’s strengths, during the appraisal or at any time you notice them. Performance appraisals have copped a lot of flak in recent years and many have questioned their value. But it’s unfair to simply blame the concept of conducting appraisals. We also have to look more closely at how we have structured them and what approach we take. Will these really create the outcome we want to achieve? If not, what do we change? Identifying and appreciating the gifts the performance appraisal process can contribute to your organisation and its staff is a great place to start.